Note: You will need a blender for the crepe batter. Combine flour, salt, and nutmeg in a medium-sized mixing bowl and set aside. In the blender add milk, eggs, and two teaspoons of olive oil before adding the flour mixture. Adding the wet ingredients first is essential. Blend for 30 seconds on a medium-low speed. Pause to scrape the sides and blend again for 30 seconds or until combined. Pour batter into a bowl and refrigerate for 30 minutes. Once chilled, remove your crepe batter from the refrigerator and stir in your scallions. Spray an eight-inch nonstick sauté pan with vegetable oil and warm the pan on medium heat until it almost starts to smoke. Raise the pan off of the heat. Using a two-ounce ladle, spoon two ounces of batter into the pan, shifting the pan from side to side until the batter forms a thin circle. Return to heat and cook. 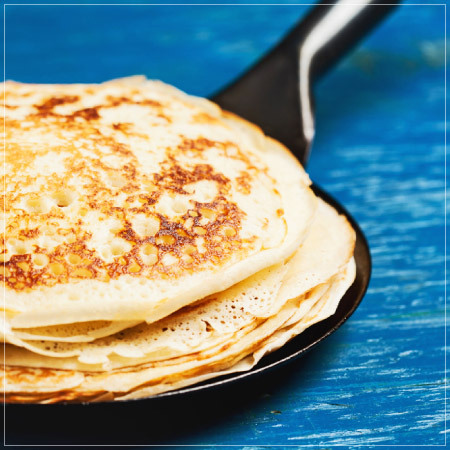 When the edges turn lightly brown, flip the crepe, using a long, slender metal spatula (if you’re feeling daring, try a flip or two by hand). Cook the second side for 30 seconds, then remove and place on a parchment-lined baking pan. Repeat these steps until you have 12 crepes laid out, side-by-side. Heat a large sauté pan on medium high and add two tablespoons of olive oil along with the oyster mushrooms. Season with salt and pepper. Cook until golden brown, about five minutes. Remove the mushrooms from heat, slice into one-inch pieces and place in a bowl. Gently separate your smoked trout, by hand, so they are in approximately one-inch pieces. Add the ricotta salata and gently mix together. Spoon two to three tablespoons of smoked trout filling about once inch from the bottom of each crepe, then roll each crepe into a long cylinder. To help the crepes stay closed, we recommend placing two crepes side-by-side, with the seal side facing down. Repeat until all twelve crepes are sealed. Before serving, place the baking pan in a 350-degree oven and reheat for five minutes. Add mayonnaise, yogurt, chopped cornichons, minced shallots, parsley, tarragon, capers, and your chopped hardboiled egg to bowl and combine. Taste and add kosher salt and fresh ground pepper as desired. Place two crepes on each plate, each generously topped with a spoonful (or two!) of Sauce Gribiche. 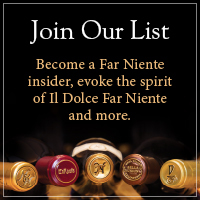 Enjoy with a glass of Far Niente Estate Bottled Chardonnay, Napa Valley.